TBS and Conan O'Brien have announced that the Conan show will be rebooted as a 30-minute show next year. Host Conan O'Brien filmed segments for a March 4 episode of his TBS talk show Conan, which will give viewers new insight into the country. Sons of Anarchy creator Kurt Sutter will join his cast on Conan for their first-ever late-night group appearance. Conan O'Brien's talk show has been averaging over 826,000 viewers per episode for 2014, with a younger median audience than any late-night show. The show will take place at the historic Spreckels Theater in downtown San Diego from July 8th through July 12th. The late-night talk show starts one week of live shows tonight from Atlanta to celebrate the 2013 NCAA Men's Final Four. 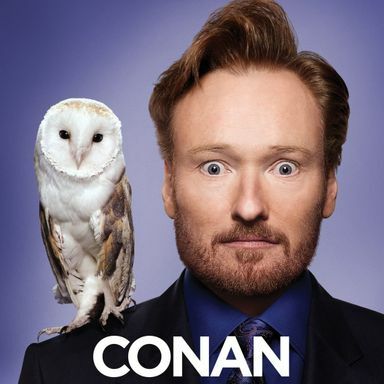 Conan is an American late-night talk show airing each Monday through Thursday on TBS in the United States. The hour-long show premiered on November 8, 2010, and is hosted by writer, comedian and performer Conan O'Brien. The program's host previously starred on NBC's Late Night with Conan O'Brien for 16 years, then presented The Tonight Show for seven months until Jay Leno's return to his version of The Tonight Show due to the 2010 Tonight Show conflict. In January 2010, after The Tonight Show with Conan O'Brien had been on the air for seven months, it was announced that NBC intended to move Jay Leno from primetime back to his original timeslot, with O'Brien's show starting shortly after midnight. Following a brief conflict, NBC announced that they had paid $45 million to buy out O'Brien's contract, ending his relationship with the network. Months after his official leave, O'Brien went on a comedy tour called The Legally Prohibited from Being Funny on Television Tour, which was largely inspired by the outpouring of support for O'Brien on the Internet during the conflict. It was announced on the first day of the tour that O'Brien would be joining TBS in November. On TBS, Conan airs Mondays through Thursdays beginning at 11:00 p.m. eastern time, and is immediately followed by reruns of The Office. The show had been followed by comedian George Lopez's talk show, Lopez Tonight, until its final episode on August 11, 2011. Comedian and actor Andy Richter continues his role as sidekick to O'Brien, and as the show's announcer. Conan's long-time house band continues with the host under the new moniker Jimmy Vivino and the Basic Cable Band, with Max Weinberg being replaced as bandleader by guitarist Jimmy Vivino and as drummer by regular substitute James Wormworth, both of whom regularly substituted for Weinberg during his brief departures.